Did you know you can make your own natural toothpaste with just two ingredients in your pantry that will not only make you have a healthier smile but also have really clean teeth? Why would you want to do this? For starters, most commercial toothpastes are laden with artificial colors and chemicals that are not good for you. Additionally, you don’t need to spend the money it costs to buy these products if you make your own toothpaste. So what are the two magical ingredients that are good for your smile and safe for you to put in your mouth? Organic coconut oil & baking soda! 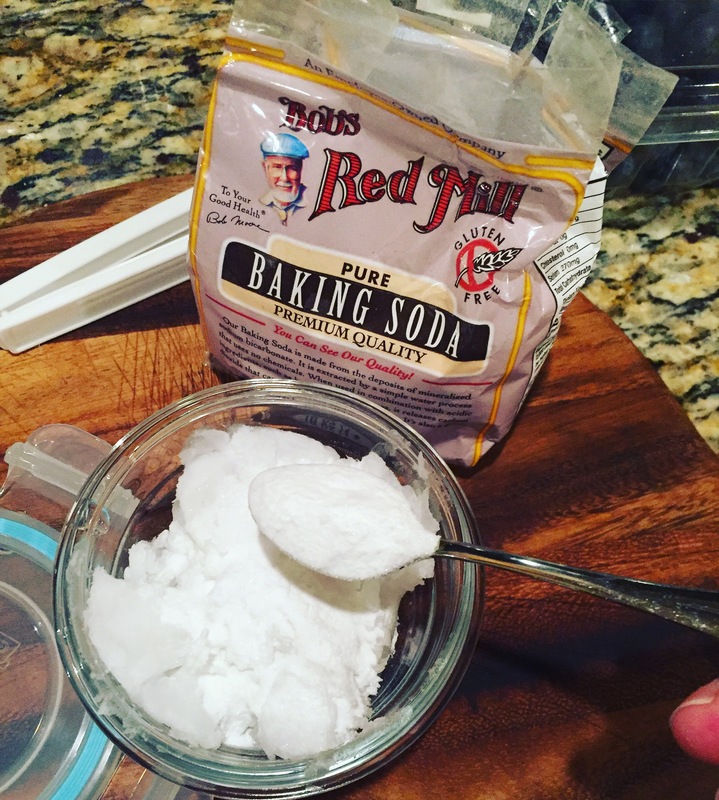 I use Bob’s Red Mill pure baking soda and Dr. Bronner’s Organic Coconut Oil. I’m sure you’ve heard of oil pulling commonly done with coconut oil so we know there are added benefits to brushing your teeth with this heavenly oil. And baking soda is a common ingredient in toothpaste because of it cleans teeth and gums so well. In fact, when I had complained of sensitive gums, my dentist recommended I brush with just plain baking soda. And the sensitivity did go away. With more research I discovered there are so many great recipes out there when it comes to making your own natural toothpaste. So I tried this one and so far I’m very happy because it’s so simple to make and my teeth have never felt cleaner or my gums healthier. Start with two generous tablespoons of coconut oil in a glass container and sprinkle in one heaping teaspoon of baking soda. Stir the mixture together. That’s it! Now brush away. You will be amazed at how clean your teeth, gums and mouth feel! When I first started brushing with this toothpaste I brushed at least one extra time per day because of how good my mouth felt afterwards. And my gums are way less sensitive now. After I brush I like to rinse with a natural mouth wash to achieve that classic minty sensation. And remember to floss 😉 I like to use a water pick filled with water and a cap full of hydrogen peroxide. It keeps things extra clean!